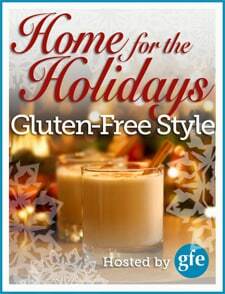 Home for the Holidays: Gluten-Free Gigi with Magical Seven-Layer Bars and More Books! I slipped in my post on Cinnamon Swirl Coffee Cake and “Last Minute” Food Gift Ideas, so I’m a tad later than usual on my Home for the Holidays … Gluten-Free Style post. So let’s get right to it and be “short and sweet” about it, much like Gigi. Okay, she’s not really short, but she is sweet! A few more things about Gigi … she’s got a Southern accent like me—love that! Gigi is as happy, positive, and fun as her name. Just like her fun and unfussy name, there’s no pretense with Gigi. She’s straightforward and down to earth with a love of wonderful gluten-free (and “more-free”) recipes, a zest to educate in a fun manner, and an overall mission to help folks live gluten free and well. Whether she’s showing you how to make a recipe using one of her videos, sharing “a side of science” (like the gluten-free indulgence that keeps stress away), or turning Christmas cookies into a craft project, with Gigi—as the saying goes—it’s all good! I loved reading about her Christmas memories with her two girls in her Home for the Holidays post. I won’t spoil the surprise, but let me just say that she’s one cool mom! When she pondered what meant “home” and “holidays” to her, she went back to her youth. She remembered and decided upon a recipe that most folks who are gluten free wouldn’t even consider, but not Gigi. Gigi makes gluten-free, dairy-free, egg-free, soy-free, vegan, and nut-free recipes all the time. So she set out to do the same with a beloved treat—those Magic Seven-Layer Bars. If you remember the recipe, it contains sweetened condensed milk and butterscotch chips. Neither are available commercially dairy free, and the latter is hard to find even gluten free. So in creating this recipe, Gigi also created recipes for those components as well. 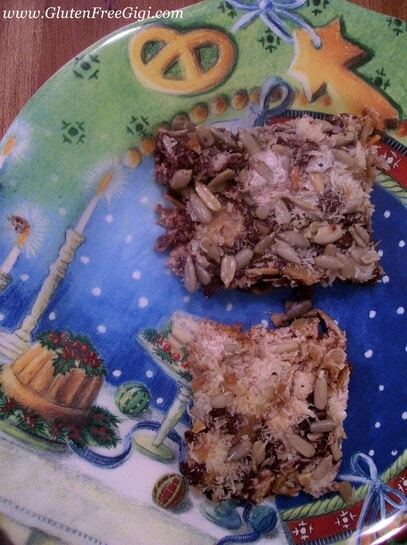 So I consider her Magical Seven-Layer Bars a Triple Crown of baking success, and I think you will, too! 7 Quick-Start Tips to Living a Healthy Gluten-Free Fit Life ~ When going gluten free, we all want quick-start tips! 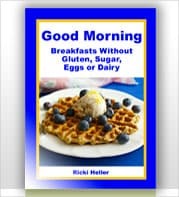 Those of us who have been gluten free for a long time wish that we had started out the healthiest, easiest way possible. 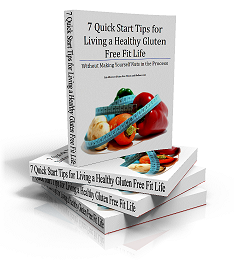 This e-book from Erin Elberson Lynn (Gluten Free Fitness and Nutrition) gives you all you need to do just that! 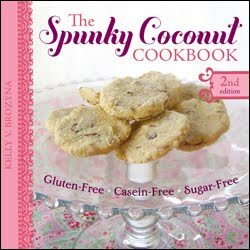 The Spunky Coconut Cookbook, Second Edition ~ Did you hear? Kelly Brozyna’s first cookbook was updated a few months back. It’s been revamped to have the same format as her more recent cookbook, Grain-Free Baked Goods and Desserts, and it now has even more delicious gluten-free, casein-free, and refined sugar-free recipes. Good Morning! 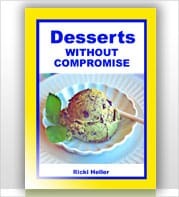 Breakfasts, Desserts without Compromise, and Anti-Candida Feast (Combo Set of E-Cookbooks) ~ Ricki Heller (Diet, Dessert and Dogs) is pretty special any time—with her writing, her humor, her photography, etc.—but she’s particularly special when it comes to recipe creation. 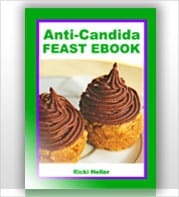 She creates truly amazing recipes that are gluten-free, dairy-free, egg-free, refined sugar free, vegan, and also work for the anti-candida diet. Gigi’s giveaway ends at Thursday, December 22rd, at midnight EST. Hurry over to enter and get the recipe for Gigi’s “pretty much everything free” Magical Seven-Layer Bars. Yesterday, Linda shared her Gluten-free, dairy-free Cinnamon Rolls. Many of us think those would be the perfect Chistmas morning breakfast! Today we have Zoe (Z’s Cup of Tea) sharing a recipe that she was inspired to make after visits to Starbucks. (Hint: The main ingredients are cranberry and white chocolate.) Remember every entry for the daily giveaways qualifies you for the final prizes: Caveman Cookies gift package ($89 value), Free From Gluten shopping spree ($150 value), and the Vitamix 5200 Super Healthy Lifestyle Package ($550 value)! Such great recipes this month! merry Christmas! Thanks, InTolerant Chef! It’s always wonderful to have your feedback. 🙂 Thanks, too, for the Christmas wishes! Hope yours is merry, merry, too! Well Shirley, you’ve certainly inspired me to go and visit Gigi’s site! Thanks for all the great giveaways. Thank you for this, Shirley… you are adorable and I love all you do for the GF community!! !